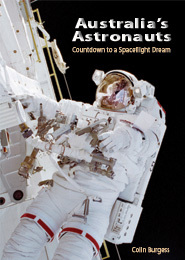 See our Space Books section to order. 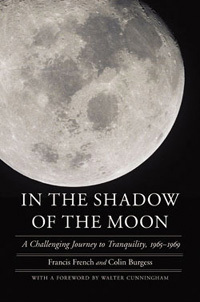 In the Shadow of the Moon tells the story of the most exciting and challenging years in spaceflight, with two superpowers engaged in a titanic struggle to land one of their own people on the moon. While describing awe-inspiring technical achievements, the authors go beyond the missions and the competition of the space race to focus on the people who made it all possible. Their book explores the inspirations, ambitions, personalities, and experiences of the select few whose driving ambition was to fly to the moon. 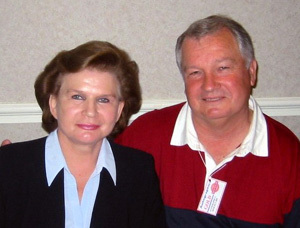 (pictured at left with Apollo astronaut Buzz Aldrin, and below with Russian cosmonaut Valentina Tereshkova). Who are your main influences as a writer? What kind of books do you like to read? I would have to say that the person who influenced and encouraged me most in my early teens was British author John Wyndham. I enjoyed his books so much I wrote to him in care of his publishers and to my great joy he responded with a couple of wonderful, treasured letters in which he said that I should start out writing short stories and this would lead, eventually, to writing a book. I was truly inspired by this great author who was something of a mentor to me. Because I immerse myself daily in non-fiction for research and to keep myself current in space matters, I generally flee to good mystery novels for mental recreation. Michael Connelly, Harlan Coben and Lisa Gardner are favourites. But I will say that the best non-space, non-fiction book I have ever read is "Flags of Our Fathers" by James Bradley. You now have more than 20 books to your name - both space histories and military histories. What have been the main challenges of writing and researching? My greatest challenge in writing any book is to try to tell a sometimes well-known story in a completely different, even novel way. I've always enjoyed tracking down people involved in these stories and getting them to reveal new stories, and this can be quite hard in the case of pioneering astronauts who have been asked the same old questions a million times over. This is when thorough research can provide questions that are completely new to them. I have to admit that I enjoy the writing, but it is the research - talking to all these very extraordinary people - that I principally enjoy when putting together a new book. 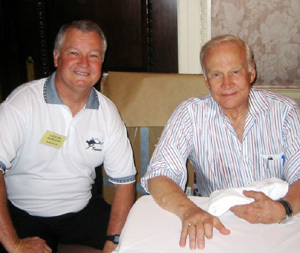 What have been some of the more memorable experiences of interviewing people who were part of the space program? Most memorable to me is the fact that I was rather shy and more than a little awe-struck when I first began interviewing my childhood heroes, but as they came to know me - and trust me - the stories came easily. The fact that they entrust you with these stories, and know you will do the right thing by them in using those stories, has proved invaluable. I once wrote a story about an astronaut who had died in a car crash in 1967 by the name of Ed Givens. A few years back I met Givens's daughter Cathrine while helping to dedicate a space museum in his hometown of Quanah, Texas, and she told me how much it had meant to her and her family that I had finally told his story. A few weeks later Cathrine gave birth to a little baby boy and told me in a letter soon after that she had named him Colin after me. That meant more than I can ever say. Who are some of the "great" characters of the space program? Who would you nominate? So many, but I would have to nominate John Glenn as the person whose Mercury space flight in 1962 propelled me into the interest of a lifetime, so I am very indebted to him for that. By far the most unforgettable character of them all would have to be the late astronaut Wally Schirra. A jovial, larger-than-life man, always laughing and cracking puns, he was the centre of attention wherever he went. Any time he caught sight of me he would jokingly boom out, "Hey there, Semi-Colon!" For you, individually and as an historian, what have been some of the really significant moments in the history of manned space exploration? What events have touched you the most? As a youngster I would often stay awake in my bed till the early morning hours listening to a manned launch on my little transistor radio, and one of my favourite recollections was listening live when Gemini 6 and 7 rendezvoused in space. Of course the landing of Apollo 11 and Neil Armstrong setting foot on the moon provided incredibly tense moments for me, followed by jubilation when all went well. I can still recall the sadness I felt when astronaut Ted Freeman died in a T-38 accident in 1964, and a few months later I could hardly believe it when his fellow astronauts Elliot See and Charlie Bassett also lost their lives in their T-38. The horrifying loss of the Apollo 1 crew also affected me deeply; I was 19 at the time and my heart nearly burst when I heard the news. Later, I can still remember waking up one morning in January 1986 and turning on the bedside radio to hear a news broadcaster talking about "the crash" of the space shuttle. For the next few hours I watched in stunned silence all the television reports about the Challenger tragedy. The same when we lost shuttle Columbia back in 2003. The history of spaceflight has been an amazing, exciting and uplifting thing to follow, but those times of tragedy remind us just how inherently dangerous space travel can be. You have just re-released your book about "Australia's Astronauts". Why do you think it's important to share these stories on a national level - about Australians who have been part of the space exploration program? I grew up in one of the most exciting all eras - the Space Age - and I felt great pride in the fact that some amazing Australians have beaten the odds and been selected to fly into space. Many of my books have focused on the indomitable spirit and can-do attitude of Australians, and I simply want to share my excitement and pride in their achievements; be they a soldier who endures under adversity or someone who realises their cherished childhood dream of flying into space. You have produced quite a number of your books within the last few years. What do you enjoy most about writing and collaborating? There are very few rewards involved in having a book published, but the greatest of these for me is an inner satisfaction. I enjoy the notion that I am writing the history of an incredible era, and that my words and books will not only live long after I have gone, but that future historians will rely on what I am researching and writing about today. Many of the people I have interviewed and written about in my books - particularly those on the Australian POW experience - have since passed away, and it's incredibly heart-warming to know that I have set their stories in print, when they might otherwise have been lost forever. Collaborating with other writers is generally an enjoyable and interesting experience. Not only do they keep you on your toes to produce your best effort, but they have fresh ideas and different contacts, while introducing ideas that might have eluded me. As well, I love working with people who have never been published before; guiding them through the mysteries, protocols and many joys of putting a book together. On so many levels, working with someone else is something I can truly say I enjoy.